The Achuar Peoples have a won a major victory in their eight-year struggle against a Canadian oil company in the Amazon rainforest. Yesterday, Talisman Energy announced that it will be withdrawing from the Achuar’s ancestral territory–and all of Peru–just as soon as it finishes some ongoing commercial transactions. The Calgary-based company first bought into the Achuar’s territory in 2004 by investing in Block 64 with US-based Occidental Petroleum (Oxy). As of 2011, the company owned 50% of Block 64 and 70% of Block 101. These oil blocks, covering some 4 million acres (1.7 million hectares) of pristine rainforest, entirely overlap the Achuar’s ancestral territory, says Amazon Watch. From day one, the Achuar made it clear that they were not going to just sit back and let another oil company have their way with the land, which has already been contaminated by 30 years of exploitation by Oxy and more recently by Argentina’s Pluspetrol. “Oxy cut costs [to its drilling operations] by dumping 9 billion gallons of ‘produced waters’ directly into the rivers instead of re-injecting them. These ‘produced waters’ contain highly toxic substances such as barium, lead and arsenic and together with hundreds of ongoing oil spills have destroyed hunting and fishing grounds and left the Achuar with severe health problems. Talisman was headed down the same dirty path. Despite enormous local opposition, the company went ahead with seismic testing and exploratory drilling operations. It also built up a false image for shareholders, the government and the international community by claiming to have support from communities and so-called good neighbor agreements with 66 communities downriver from their operations. 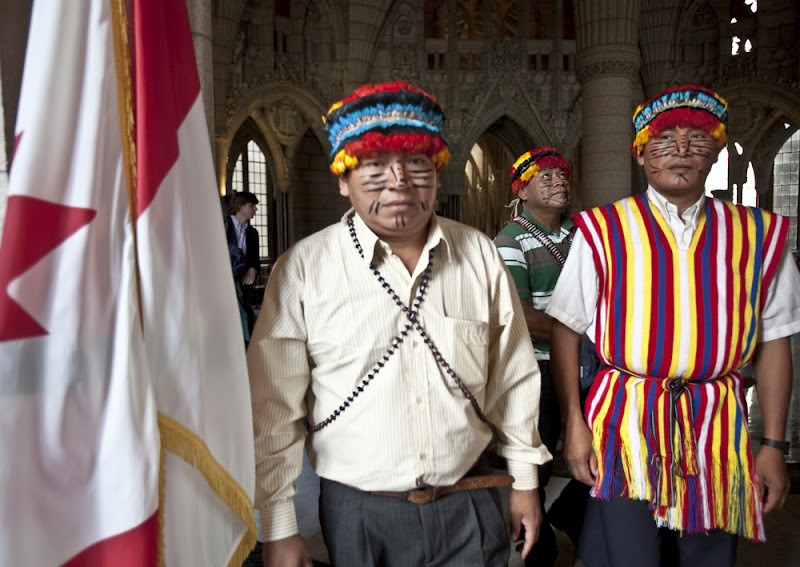 The company never had such widespread backing–a fact that Achuar Leaders made clear throughout their four separate trips to the Canadian landscape. In other words, it’s because the Achuar wouldn’t take “yes” for answer.